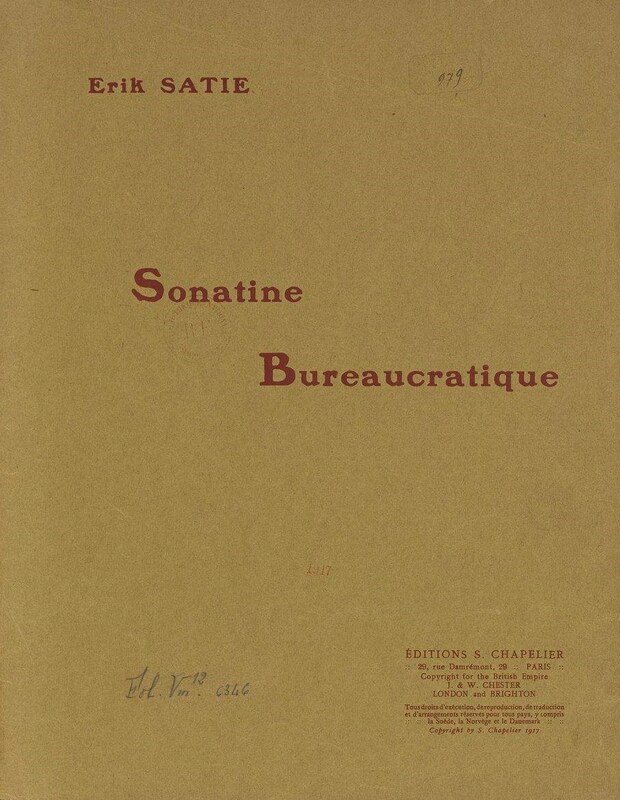 Sonatine Bureaucratique, one of Eric Satie’s short humoristic pieces, is largely appropriated from Muzio Clementi’sSonatina in C major, op. 36, no. 1 and “narrated” with marginalia inserted between staves describing the titular Bureaucrat’s day at the office—a day during which no actual work is accomplished. The bureaucrat enters the office, sits around, and dreams of a promotion, or an increase in pay without a promotion, or the superior flat he’s been eyeing. He listens to the playing of a nearby piano playing and leaves. Benjamin Buchloh inserted a page of Satie’s score in his essay Conceptual Art 1962-1969: From the Aesthetic of Administration to the Critique of Institutions as published in October magazine Vol. 55, Winter 1990. Buchloh perceived Satie’s appropriation of Clementi and the accompanying satirical narrative (suggesting the apathy and craven attitude of his Bureaucrat) as an early example of the “Aesthetic of Administration”—certainly boredom, repetition and quotation along with a bureaucratic anti-aesthetic play important roles in Satie’s work. These represented a break with the conception of seriousness and quality in music that was dominant during the early 20th century. For Buchloh, Conceptualism was consciously aligned with scientistic, administrative, academic, and bureaucratic procedures as a move against the established aesthetic qualities of the time, constituting a similar break in the continuum of visual art. This show began with a recognition of the systematic and morphological similarities between certain works of conceptual art executed during the 1960s and ‘70s and emergent paradigms in the field of information technology, especially developments within the realms of modeling/simulation, facial/object recognition, and data mining. The show ultimately expanded to encompass the drift from the relatively benign bureaucracy gently critiqued by Satie to the full-blown rationalization and control apparatus functioning today. Half a century after Satie, a number of works of conceptual art seem to prefigure or predict recent technological developments. Douglas Huebler’s then-absurb proposition put forth in Variable Piece #70—to photographically document the existence of everyone alive—has largely been realized with the advent of NSA’s massive data-storage program and implementation of Multi-Agent World Simulations. His Location series prefigures Google Maps and Street View. Charles Gaines’s “irrational” coding and gridding of biological phenomena, including Walnut Tree Orchard and Faces, have been instrumentalized under the rubric of facial and object recognition. Guy de Cointet’s ‘drawings’ from A Few Drawings are comprised of purely numerical codes prefiguring the digital basis of all representation in current information technology. These projects, impossible and irrational at the time, foreshadow contemporary computationally-driven projects to such a degree as to appear to be precursors to the current conditions. British technology site the Register reported in 2007: “The Department Of Defense is developing a parallel to Planet Earth, with billions of individual “nodes” to reflect every man, woman, and child this side of the dividing line between reality and AR. Called the Sentient World Simulation (SWS), it will be a “synthetic mirror of the real world with automated continuous calibration with respect to current real-world information”. The LAPD now employs LASER software, a next-generation version of a data mining platform originally developed by the CIA, which powers their Real Time Analysis and Critical Response Division: coordinating license plate readers and other forms of surveillance, data mining ,and near-immediate response throughout Los Angeles. More than 3500 officers currently employ LASER- all LAPD cars, motorcycles, helicopters, and special vehicles are equipped with cameras that feed information to it. Many streets, highways and buildings throughout metropolitan Los Angeles are equipped with license-plate readers and other forms of surveillance which feed into the system. 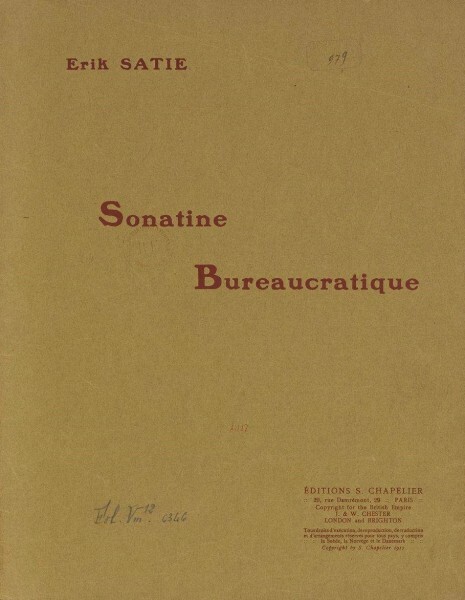 Sonatine Bureaucratique features found and archived material from seemingly disparate spheres presented in conjunction to illuminate how the works of certain conceptual artists ultimately prefigured contemporary systems that have become thoroughly aligned with an administration of social control. Including original catalogs and artist’s books by Guy De Cointet, Charles Gaines, Douglas Huebler, and Seth Siegelaub. The show also includes video and printed material detailing the emergence of Sentient World Simulations, Lambda Labs’ facial recognition API and LAPD’s Real Time Analysis and Critical Response Division.